1. These maximum dimensions are for a single upright monument or plaque on a standard single plot. 2. The standard single plot is 48 inches wide. Maximum base widths may have to be reduced to fit 'non standard' plots in the older parts of the cemetery. Plot & monument widths should be confirmed with cemetery staff before finalizing an order with a customer. 3. 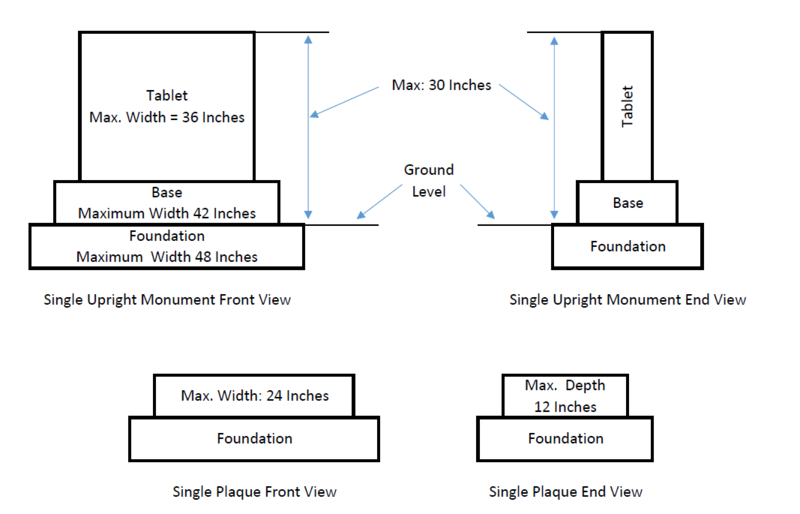 For double monuments on double plots, the maximum width of the base can be up to 84 inches. 4. For infant monuments, the maximum tablet height is 24 inches above ground level and the maximum tablet width is 20 inches. 5. All monuments must be constructed of either granite, marble or bronze. 6. Permits are required for all monument installations in all cemeteries. Monuments must be installed according to the requirements stated on the monument permit form. 7. Locations of burials in the plot should be confirmed before ordering the engraving of names on the monuments. 8. Cemetery staff will identify the exact location for the monument placement on the plot. 9. No more than one plaque is permitted to be placed in front of an upright monument. Flowerbeds and ornaments may have to be removed in order for the plaque to be placed. 10. Families are responsible for the maintenance of their monuments. Any levelling or straightening required as the ground settles is the family responsibility. Cemetery staff will only straighten or level a monument if it has become unstable and presents a safety hazard. 11. If a monument is damaged by cemetery staff, it will be repaired or replaced through an invited bid process in consultation with the family and the preferred bid will be selected. This may not necessarily be the original monument supplier. If the exact monument model is no longer available, then the next available model will be purchased.